Costumes are an integral part of any performance, adding believability, conveying setting, or establishing the tone, a fact that is no less true when your performer is a puppet! 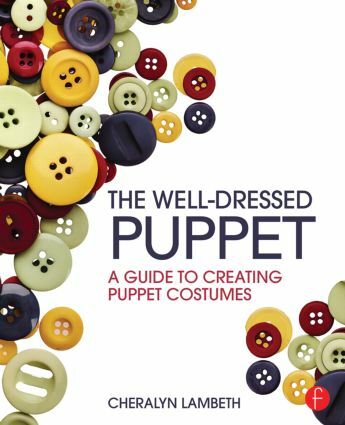 The only book of its kind, The Well-Dressed Puppet will show you how to create costumes and accessories tailored specifically for your puppet that will enhance any performance. Gone are the days of ill-fitting store-bought clothing that restrict the movement and use of your puppet. Author Cheralyn Lambeth walks you through every step of the costume-making process with detailed lists of the necessary materials, equipment, and patterns required to create a costume from scratch. She also shares multiple tips and information on how to modify off-the-rack clothing to fit any puppet. Suitable for both beginners and more advanced costumers, The Well-Dressed Puppet demonstrates basic sewing and construction techniques while still providing advanced projects for customers who have already mastered those skills. Cheralyn Lambeth is a costume, prop, and puppet builder whose work includes feature films (The Muppet Christmas Carol, The Patriot, The New World, Evan Almighty, Leatherheads, and The Hunger Games), theatre performances (Sesame Street Live, Avenue Q), interactive exhibitions (The Star Trek Earth Tour, Titanic: The Movie on Tour, and Star Trek: The Experience at the Las Vegas Hilton), and the television series Dinosaurs! and Homeland. She currently works as a puppet builder, costumer, and occasional performer with Grey Seal Puppets.